Does it take far too long to style? Keratin is a natural compound and is the protein that gives hair its strength. Kerastraight rebuilds the keratin within the hair that has been lost working on both the internal cortex and external protective layer, the cuticle. The result is hair that has added elasticity, strength, vitality and incredible shine providing a smooth, soft and straightened finish. The Process is fortified with the addition of nano-molecules of 22ct gold which attract to negative ions within the hair producing the highest consistency enabling this gentlest of treatments to give the most stunning results. What makes Kerastraight the first choice over alternative products? Our products are designed by hairdressers who understand the needs of both salons and the clients. It also has the endorsement of some of the greatest award winning hairdressers who value the KS Treatment range as not only providing the ultimate results but also the fact that Kerastraight is completely and certifiably safe for the user and consumer. Are Kerastraight Treatments permanent hair straightners? No, our range of treatments are based on the hair’s natural proteins and will gradually fade from the hair. Can Kerastraight be applied on pre-treated or coloured hair? Yes, Kerastraight treatments can be applied to all hair types including highlighted, bleached, coloured and also on hair that has no history of chemical services (virgin hair). When can I colour my hair if I want to have a Kerastraight? Hair can be coloured either 2 days before the service or alternatively 2 days after. It is usually best to highlight prior to the Kerastraight, and full-head colour after the Kerastraight treatment. 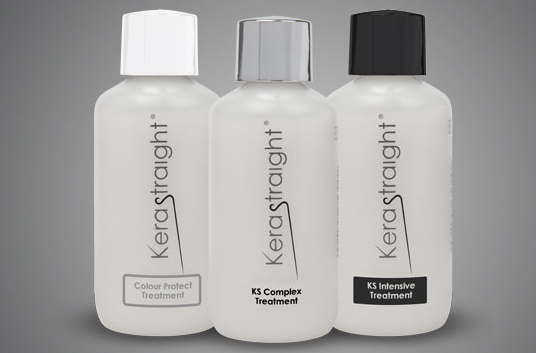 Can Kerastraight be applied on hair that has been permed, chemically straightened or relaxed? Yes, our treatments can be used on any hair that has had previous chemical services. Will Kerastraight work on very curly and Afro Caribbean hair? Yes, KS Intensive has been developed to give a more powerful result for these hair types. How long do Kerstraight Treatments keep the hair straightened, smoothed and repaired? The benefits will last in the hair for a period of up to 4 months depending on the hair type. On hair that has had previous chemical services the results are more dramatic and last longer. With hair types that are natural with no chemical service history, the results are better and last longer after subsequent treatments. How long does the service process take? Usually between 2-4 hours, depending on hair type and length. What after-care is recommended to ensure best possible results are maintained? Kerastraight recommends using only the Kerastraight Straight Maintain Shampoo and Conditioner (which is built into the cost of the service for you to take home with you). These products are Sodium Chloride and Sulphate free and have been developed to maximise the longevity of the Kerastraight Treatment. For more information and prices, please call Paula on 020 8676 9593 or pop into the salon.